Today is my 7th wedding anniversary and I wanted to share the card I made for my husband. I have mentioned in previous years that we got married in Malta with our closest family and absolutely loved it there. It is something I would recommend to anyone not wanting to get married abroad. It was a lovely day and a lovely holiday. Anyway back to the card. I chose the paper first and went with the Studio Calico Darling Dear and Here & There. On one of the pieces from the Darling Dear pad is a lot of images and one of the images was this one with the words you & me and I thought it would be perfect for the centre of the card. I decided to put it on a label from Clearly Besotted lovely labels and rather than using the rectangle it comes with for the centre I thought the square fitted well. As I am loving the Happy word die from Clearly Besotted I used it here with the word anniversary from the Clearly Besotted Basic numbers and stamped it on a tag from the Clearly Besotted tag along dies. I decided to use an embossing folder on the background and add some stars and hearts as well. 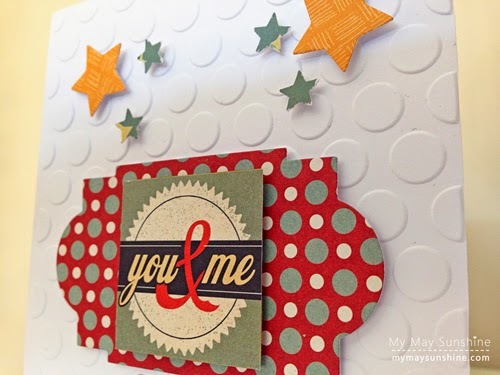 Paper – Studio Calico Darling Dear and Here & There | Stamp – Clearly Besotted Basic Numbers | Dies – Clearly Besotted Lovely labels, Tag along and happy word die | Embossing folder – Cuttlebug Seeing spots | Large stars – Sizzix stars. I got a lovely card and pretty flowers from my husband for our anniversary but it was prompted by a few people as he didn’t even get me a card for Mother’s day but mustn’t complain (much!). Hehe. Hope you are having a great weekend. See you soon. Next Post Changing things up.